An audience member shares their experience of the Music Man Project’s special night at the London Palladium. Well, it was a night like no other. It was the night of Music Man David Stanley and tutor Jenny Hitchcock who presented Music is Magic and the musical “From the Asylum to the Palladium”. 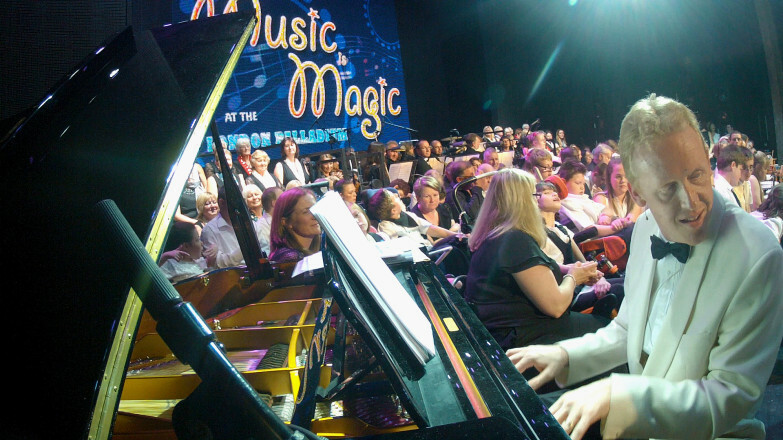 The line-up was drawn from students who attend the Music Man Project sessions across South Essex and featured children from their client special schools: Kingsdown, St Nicholas and Glenwood. David and Jenny believe that regardless of any learning disability, difficulty or special educational need, everyone should have a chance to learn about music and it should be a fun and enjoyable learning experience. The show was spectacular, with student stars singing, signing and playing original music and songs from The Music Man Project Songbook written by David Stanley with lyrics by Jenny Hitchcock. Emotions ran high when the story from David’s “From the Asylum to the Palladium” was played out to the full house. It is the story of how not so long ago people were cast out for being different, having children out of wedlock, being poorly behaved, gay or mentally ill. These people were made to live in institutions in remote places surrounded by beautiful gardens. That was until Joe Dorado arrived from Spain and worked as a cleaner sweeping the floors in a large psychiatric hospital. He observed the conditions in which patients lived, with no privacy, no dignity and no personal possessions. He asked the question: “Would you wear someone else’s knickers?”. How times have changed. 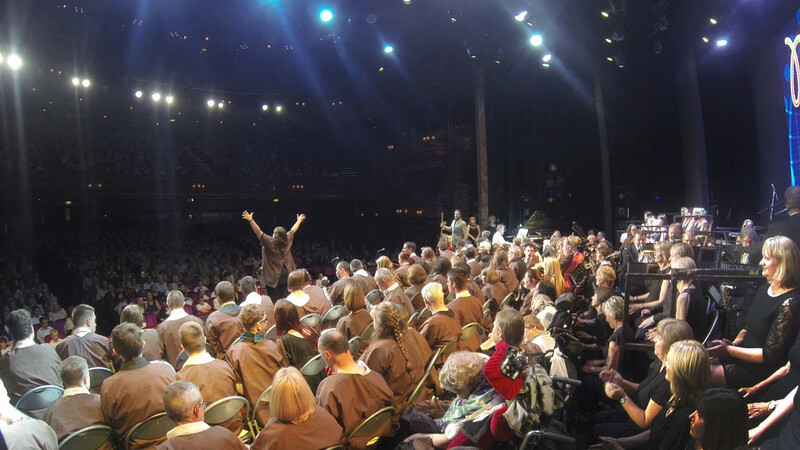 This was the story of how vulnerable people became West End stars for one very special Sunday Night at the London Palladium and it moved the house to tears. Its message inspires us all to learn from our history and embrace everyone precisely for being different and for the positive gifts they possess. The evening showcased what children and adults with learning disabilities can achieve musically given the chance to try music and to learn at their own individual pace. There were hundreds of performers on that stage with some needing the support of one or two crew members to get to their cue. The crew performed a logistical miracle to ensure this happened. How they managed to position an orchestra, choir, all those chairs, instruments, microphones, props and other paraphernalia while allowing a safe walkway for performers, wheelchairs and enormous carnival costumes to pass through unhindered is a lesson in precision logistics. I found myself caught up in the music, swaying, toe tapping, stamping, crying, laughing, dancing, singing and hoping the party would never end. But it did end and they brought the house down. Thank you thank you thank you for a fantastic evening. I nominate you ALL for a STARS award because to me you were All STARS in the Healthy category for reducing inequalities and increasing the life chances of the people living in Southend by ensuring high quality health care & well-being, improving outcomes for the vulnerable.